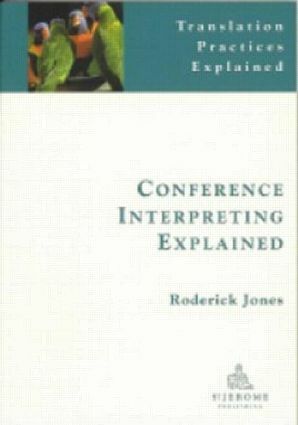 Roderick Jones adopts a very practical approach to both consecutive and simultaneous interpreting, providing detailed illustrations of note-taking, reformulation, the 'salami' technique, simplification, generalization, anticipation, and so on, including numerous tricks-of-the-trade such as how to handle difficult speakers and how to interpret untranslatable jokes. Numerous examples are offered at every stage, all in English or 'foreignized' English. Although primarily written as a practitioner's explanation rather than a theorist's speculation, the book includes notes on concepts such as units of meaning, translation units and discourse structure, as well as stances on more polemical issues such as the use of omission and the ethics of interpreting mistakes. The book concludes with a comment on the pleasure of conference interpreting, as well as a glossary and suggested further readings. In all, it fills a major gap in English-language publications on interpreting, providing an introduction for beginners, a down-to-earth guide for students, and a handy compendium for teachers. The first edition of this book was published in the series Translation Theories explained, at a time when St. Jerome had no separate series for books on practice as such. Happily, it has now found its rightful place in the Practices series. Modifications with respect to the first edition include an updated reading list, an index, and guideline tasks for training sessions. The popularity of the book since its first appearance in 1998 suggests that little else needs to be changed.